The 90 Day Fiance baby boom continues! 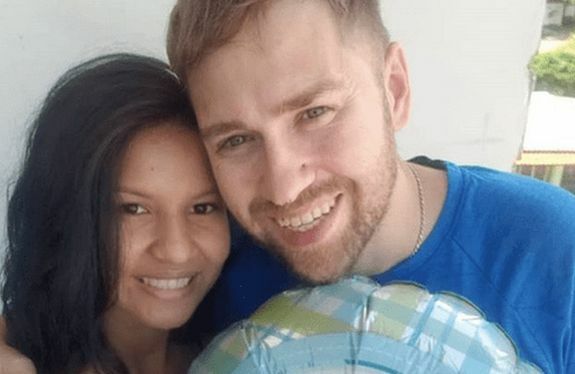 Paul and Karine Staehle— who starred on the “90 Day Fiance” spin-off Before the 90 Days— announced the arrival of their first child on Friday, March 22 in Karine’s native Brazil. The couple named their baby boy Pierre Martins Staehle. Us Weekly reported that Baby Pierre weighed in at 6.9 pounds and measured 19.7 inches long. A new #90DayFiance baby! 🍼Paul and Karine have welcomed their baby boy. Visit TLCme.com for all the details. Karine reportedly had a very difficult labor and delivery that lasted several days. Paul took to Instagram on Saturday to ask for prayers for his wife. (On Friday, someone leaked photos of Karine in labor to the site Soap Dirt.) However, it appears that, when Paul was asking for the prayers, the baby had already been born, which angered some fans on social media who thought he was trying to create drama. However, Karine told Us Weekly on Monday that she is doing well now. Paul– who married Karine in 2017– told the magazine how happy he is to have a healthy baby. As “90 Day Fiance” fans know, the couple experienced two miscarriages in a short period of time— one of which was covered on the show— before having Pierre. One thing Paul is not thrilled about is the baby’s name. Us Weekly reports that Karine chose the name, and gave the baby her maiden name, Martins, as its middle name. Baby PMS is just one of several babies to be born to couples from the “90 Day Fiance” franchise over the last few months. In January, “90 Day Fiance” Season 1 couple Mike and Aziza Eloshway welcomed their first child, daughter Olivia Joan. That same month, Elizabeth Potthast and Andrei Castravet of Season 5, became parents to daughter Eleanor Louise. Weeks before that, Season 1 Russ and Paola Mayfield welcomed their baby boy, Axel, on New Year’s Day, just minutes after the clock struck midnight. I’ll bet good money that *someone* who leaked the photos was Paul. I just hope Karine knew about it bc the picture I saw she wasn’t looking at the camera/phone. Waiting for the next fight when Paul accuses Karine the kid is not his. After the STD and pregnancy tests he made Karine do nothing surprises me anymore. I will never, ever understand why Karine stays with this weirdo. Anyone who watched the last two seasons knows there’s just something not right about Paul. There is something very off about him. God they need help. Beyond google translate.